The worst part about grocery shopping is when you hand over your credit card – produce can be expensive! What makes it worse is we don’t eat everything we buy. There’s a whole lot more that can be done with what we don’t use in our kitchen. Here’s a few tips to remember when repurposing your food scraps. Starting up your very own compost pile is easy. Set aside a 3’x3′ area in your yard. You’ll need good air flow, heat and moisture to encourage decomposition. Raking your scraps and soil regularly, as well as keeping them well watered in direct sunlight, will cover all your bases. You can eventually add this dark, rich soil to your garden, or use it to pot new plants. Leftovers of almost any kind are welcome. Egg shells, fruit and vegetable peels, old tea bags, soured milk, coffee grounds or stale bread are a few good starters. You can also add sticks from your yard and lawn clippings to the pile. Let Your Fruits and Veggies Rise Again! Regrowing your scraps is simple, easy and more convenient than you might assume. There’s a long list of produce scraps that can be repurposed, but here are a few popular ideas you might want to apply to your garden. When repurposing your celery scraps, cut off the base of the cluster. Place the base in a shallow bowl of warm water, and expose to direct sunlight for as long as possible each day. After a week, you will notice leaves sprouting up from your base, and it will be time to plant your growing celery stalks in potting soil. Water regularly, and enjoy! Most people have the best luck potting pineapple tops in sandy soil. Bury the head of your pineapple under the soil so the dirt covers everything below the base of the leaves. You’ll want to keep your plant moist, and in indirect sunlight for the first two months of growth. After the initial six to eight weeks, a more mature root system will begin to form and you’ll be able to replant your new pineapple tree. After peeling your potato, find a peel about 2 inches long with multiple eyes visible on the skin. This peel can be planted immediately in direct sunlight, about 4 inches below the surface. It may take several weeks to notice growth, but a sprout should be visible in no time. There are quite a few vegetables and fruit scraps you can turn into growing plants. Click Here for a larger list. 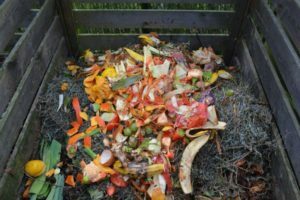 By repurposing food scraps in your garden – whether as plantings or as compost – you can save some money and feel good about helping the planet at the same time. Article adapted from Mother Earth News.